Jonty Pearce “Sailing to St Kilda” – Cancelled due to Venue. 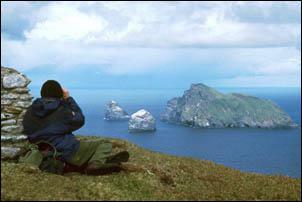 The most remote part of the UK, St Kilda lies in the North Atlantic 40 miles west of the Outer Hebrides. 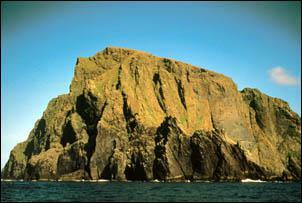 Not an island at all, but an archipelago comprising the islands of Hirta, Soay, Boreray and assorted other rocks, its exceptional cliffs and sea stacs form the most important seabird breeding station in Europe. The evacuation of its native population in 1930 brought to a close an extraordinary story of survival; it was estimated that each person on St Kilda ate 115 fulmars each year and the St Kildans were known to eat puffins as a snack! No Walkers crisps there! One of only 24 global locations to be awarded ‘mixed’ World Heritage Status for its natural and cultural significance, St Kilda’s population now comprises just 15 staff manning an MoD radar tracking station for the missile range on Benbecula, Outer Hebrides. And an increasing number of fulmars, puffins, gannets, skuas, kittiwakes, etc! Sailing to St Kilda can be a tricky business given the Scottish / North Atlantic weather (and missiles whizzing overhead!?) and, when you get there, the only two possible anchorages are problematic to say the least. It’s recommended that you carry at least two anchors! Jonty has been there, done that, and will tell us all about it.